Christmas, a festival of peace and reconciliation, has helped European cultures to preserve many of their ancient beliefs and practices. 'Father Winter', for example, survives as 'Santa Claus', while evergreen tree worship survives in the adoration of the Christmas tree. Such Christmas-time customs present patterns that Christians and non-Christians alike may recognize. People the world over venerate the tree as a living symbol of human dreams and aspirations and, indeed, of life itself. And yet, many who venerate the tree for whatever reason are surprised to find that other societies also do so very much as they do within the context of their own cultural traditions. For not only in its abundant generosity towards humanity but also in its utility as a universal symbol of sublime metaphysical principles, every tree is an offshoot of the 'World Tree' that reappears in different guises. 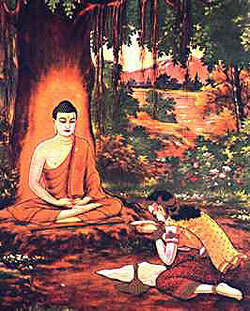 Sujata offers milk rice to the bodhisattva Gautama seated under the Bodhi Tree. Modern society values the tree for little more than its market value in landscaping, food production, building construction, and so on. But our ancestors also knew a great deal about the world they lived in, and applied that knowledge accordingly. It should come as no surprise to us, therefore, if some of those ancient applications should again come to light in the course of modern research. In Buddhist countries like Sri Lanka, the bodhi puja is a reminder that tree-worship or, rather, the veneration of tree spirits, has been an important feature of Asian cultures since at least the time of Gautama Buddha in the fifth century BC and probably much earlier. For according to Buddhist legend, the boiled milk rice that Sujata (Skt: 'well-born') offered Siddhartha just before his spiritual awakening or bodhi had been prepared as a food-offering to the spirit of the Bodhi Tree under which Sujata found seated the bodhisattva Gautama. Sujata is said to have been so impressed by his appearance that she assumed he was the embodiment of the spirit of that sacred fig tree. No doubt, in a certain sense Lord Buddha was the spirit of the Bodhi Tree and in that sense Sujata was correct in her decision to make her offering to the radiant ascetic she found seated under the very tree that has been her original destination. Subsequently, the distinguished art historian Ananda Coomaraswamy in his study of the ancient yaksa cult has fairly conclusively established that the term yaksa (Sin. yaka), which in modern usage has come to mean 'demon', originally meant any kind of spirit and, in particular, tree-spirits. By a similar process, the ancient Greek word daimon, which originally meant any supernatural being or indwelling spirit, comes down to us as the English word 'demon'. Both instances suggest a gradual inversion of meaning over the course of time as popular familiarity with the supernatural or spiritual gives way to unfamiliarity and fear of the unknown. In fact, many classes of spirits still to this day suffer from 'bad press' at the hands of unknowing human beings. Asura, for instance, originally meant asu-ra ('life-giving', i.e. deity) before turning into a-sura (non-shining') by a pundit's twist of unsympathetic interpretation. Pre-Christian Europe, where trees and forests were especially venerated, was a veritable hotbed of tree worship, and remains so to this day in one form or another. Small wonder, then, that the tree is the symbol of the international 'Green' movement, or that the movement first took root in Europe where it is growing to this day. The cult of the tree was especially prevalent among the early Celtic and Nordic peoples of western and northern Europe respectively. Celtic wizards or magicians, called druids, selected sacred tree groves as the best sites for their esoteric ritual performances. In his famous book The White Goddess the antiquarian researcher Robert Graves observes that trees were widely associated with arcane wisdom and ritual magic among early European peoples. His suggestion that the Celtic term 'druid' may be traceable to the Sanskrit taru-vid ('tree-knowing') is a plausible linguistic possibility. 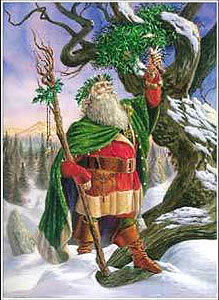 Among Celtic peoples every kind of tree or plant was valued and venerated for its particular character and properties. Oak and ash trees, among others, were felt to be especially powerful as bearers of magical wisdom for those who knew their inner essence. In ancient Rome, late December was the time for the celebration of the Saturnalia, a festival of unrestrained merry-making and wild revelry that was the predecessor of modern Christmas-tide. Among other peoples of early Europe, such as the Nordic people of Scandinavia, any tree that did not 'die' by losing its foliage through the bitter cold of the long freezing winters was considered to be harboring a tree-spirit of unfailing life. Appropriately called 'evergreens', such trees are common at high altitudes and far northern latitudes. It is not surprising, therefore, that evergreen trees are associated with mountains and the far North. Special sanctity was attached to the period of the winter solstice in most traditional societies of Europe even before the introduction of Christianity in the first millennium A.D. In ancient Rome, late December was the time for the celebration of the Saturnalia, a festival of unrestrained merry-making and wild revelry that was the predecessor of modern Christmas-tide. 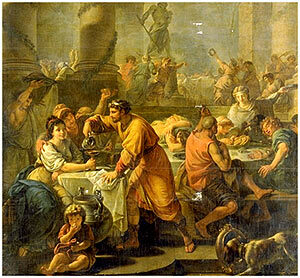 The poet Catullus describes Saturnalia as the best of days: a time of celebration, visits to friends, and gift-giving. During the Roman celebration of the feast of Saturnalia, the Romans decorated their homes with the clippings of the evergreen shrubs. They would also decorate the living trees with pieces of metal and images of their god. The Romans are said to have started the tradition of decorating their homes with the evergreen. December was also the time for special rites dedicated to Dionysus, the ancient god of revelry and renewal. is commonly represented as a tree. In Europe as well as in Asia (in fact, world-wide) the Tree was considered to be the living image of the axis mundi or 'Axis of the World' (Skt. stambha), a still point or vertical shaft around which the world turns and from which its ordered patterns are derived. Biblical symbolism associates the Tree of Life with the centre of the Garden of Eden or paradise. In Islam also the imagery of the Axis (Arabic: qutb) figures prominently in the orientation towards the Kābah in Makkah of all praying believers. According to Islamic lore, qutb is also the highest stage of sanctity among Muslim saints and refers to one who has attained to that degree of sanctity which is a reflection of the heart of the Prophet himself. 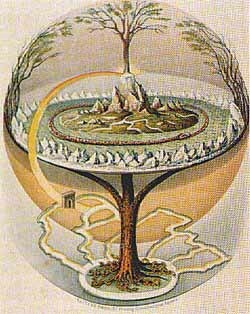 It is therefore natural that the Axis of the World should be associated with the Tree of Life or World Tree, for both are representations of the Vertical Ray that sheds grace from heaven to earth and binds the two as one in a covenant or contract of ordered activity. That contract is symbolically renewed in the cold dark period of winter solstice (late December for most of humanity living in the northern hemisphere) when the life-giving sun has reached the limit of its journey to the south and is due to begin its return. This association of the sacred Tree with the earth's axis emerges most clearly in the assimilation to Christianity of pagan beliefs and practices in pre-Christian Europe, many of which still persist in modified form. For example, the original date of the year for the celebration of the mass of the Christ-Child -- called Christmas -- may never be known. But the Holy See decided upon late December as the most suitable time for the celebration of Christianity's high holiday -- the arrival from heaven of the Divine Child. The proximity of Christmas to the time of the winter solstice was in all likelihood no accident and served to identify certain pagan beliefs and practices with Christian themes of renewal and so on. Thus, winter solstice-time rites of the evergreen tree easily evolved into those of the modern Christmas tree, as did other practices such as that of kissing a girl standing beneath an archway hung with mistletoe berries and leaves. All suggest an association of Christmas and winter solstice with the colours red and green. 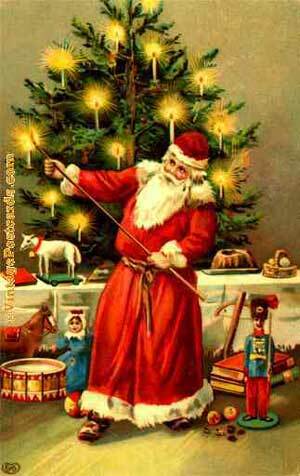 Various pagan cultures of northern Europe portrayed the spirit of winter solstice broadly as 'Father Winter'. With the Christianization of these cultures, Father Winter was naturally transformed into Father Christmas, the spirit of Christian generosity and festivity. The North-South polar symbolism of the winter solstice in turn made it only natural to associate Father Christmas with the earth's own North Pole, so that today the spirit of the North Pole is also the spirit of Christmas. Likewise, the ever-green Christmas Tree also, in its own wise, already represented the 'World Tree' or 'World Axis'. The 'Star of Guidance' that crowns the Christmas Tree is also related to the North or Pole Star that is always directly overhead at the North Pole. This natural compatibility of Christmas celebration with late December and beliefs about the evergreen tree, the North Pole, and the spirit called Father Winter still survives in Christian guise. Father Winter or Father Christmas has since those days evolved into Saint Nicholas or Santa Claus. Santa, Father, or saint, the Spirit of Christmas, evergreen trees, and the North Pole still lives on in forms that much of modern humanity partakes of. The feasting and sharing of ritual gifts mark Christmas as a festival of wishes, hopes, and -- most importantly -- the fulfillment of hopes and promises. Here perhaps lies the secret of its universality. The spirit of the North Pole, now called Santa Claus, was well-endowed with elfish helpers and magical abilities in olden days. And this is still widely believed to be the case today or, at least, it is so among innocent children, whom the Prophet Jesus himself urged his followers to emulate. Unseen but spoken of highly, Father Christmas was and still remains the granter of wishes for all good girls and boys. Popular belief situates Santa's workshop-residence at the earth's North Pole, where he and Mrs. Claus direct the activity of a legion of their elfish companions in the task of preparing everyone's own just reward for delivery at Christmas-tide. The young are encouraged to formulate a wish or wishes, and to put it all in writing as part of a bargain with Santa to be true with him in return for his generosity. And, in fact, many thousands of such letters addressed to 'Santa Claus, North Pole' are directed to the Canadian postal service, whose servants forward the mail accordingly. Of course, Santa already knows what to give and to whom, for such magical wisdom is part and parcel of the pole spirit, qutb. But it is on Christmas night that the magic of Christmas really comes alive. For this is the moment in the year when Father Christmas comes down from the pole and in one magical sweep answers the prayers of believers world-wide in a single night. On that mysterious night -- we are told -- Santa's helpers load all the goodies into his magical sleigh. According to popular belief, the sleigh can fly when drawn by enchanted reindeer. With this as his vehicle (Skt. vahana) and with one last kiss from his spouse, Saint Nick flies 'as quick as lightning' in the middle of Christmas night. Occasional eye-and radar-sightings are known to occur and the matter is still under investigation. Coming down from his home on the top of the world-axis, the spirit of Christmas then performs a stealthy visit to the homes of all good children. 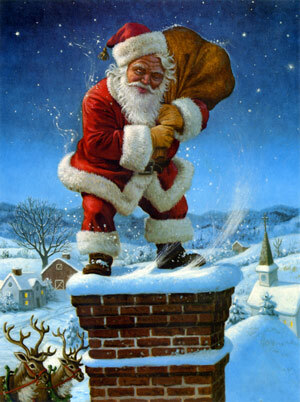 To elude detection, he enters vertically down through the house chimney instead of horizontally through a door or window as a mere mortal might do. This also is a clear indication of the association of Father Christmas with a vertical shaft like the tree, the chimney, or the earth's axis. 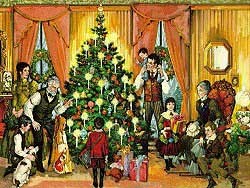 In many homes, children would hang their long stockings from the fireplace mantel in hopes that Santa Claus would find the stockings and deposit a treat for each child. In our parents' time during the Great Depression, a good child might get a real orange-fruit while a child who was naughty all year might expect a lump of coal in his Christmas stocking as a sign of justice. Children still lay out tasty foods before going to bed on Christmas Eve so that Santa Claus may pause and refresh himself before climbing back up through the chimney to his waiting reindeer-team. 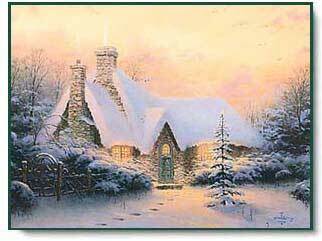 In my own childhood, Santa Claus was never once fooled by our frequent shifts from house to house and place to place. He always managed to deliver the goods right on time without searching for us. We were always delighted to find that he had eaten what we had left out for him, and uncontrollably excited to find what we had left behind for us. Father Christmas never once disappointed us. I will never forget our excitement one year when we discovered the clear imprint of Santa's left boot upon our fireplace. It appeared that his boots were full of soot from climbing down our chimney. But the mysterious little man's black boot print was indelible and remained for years as our own private secret. So the veneration of footprints is not restricted to Asia alone. most of the symbols and rewards were assembled together. The tree, a natural focus of everyone's hopes and joys, also represents the same vertical passage that the Spirit of Christmas so marvelously performs with great ease. I believe there must be some connection between all these elements. Here in South Asia, traditions concerning the enchanted World Tree or World Axis have taken somewhat different forms. And yet, despite the differences, certain patterns persist. The sacred Tree, the vertical World Axis or stambha, the generous spirit from the far North: these are all features of pan-Indian culture that derive, most probably, from the very same source. It is worth noting that the European spirit of the North Pole or Christmas also has its structural counterpart in Indian mythology. 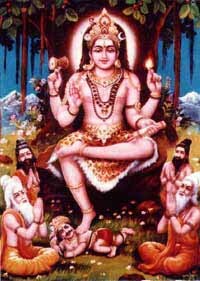 In his aspect as World Teacher, god Siva is known as Dakshina-murti, 'He who faces the South'. But Lord Siva has five faces, and for all of them to be facing southward he would have to position himself at the North Pole, where every direction is south, leading away from the extreme limit of the North Pole itself. Or do Siva Dakshinamurti and Santa Claus both operate from the same unique address? Only further study may tell. Whether the spirit is Christian or not, merry Christmas to all! Find out more about the origin of Santa Claus in America. Patrick Harrigan is an American researcher and journalist who has been visiting Sri Lanka since 1971. He is also the editor of the Kataragama Research Publications project and of Bhakti, the Journal of the Kataragama Devotees Trust.